This week in the war, on 19 April 1943, the eve of Passover, German troops entered the Jewish ghetto in Warsaw. Many Jews had already been taken from the ghetto and deported to the east, supposedly to work camps. 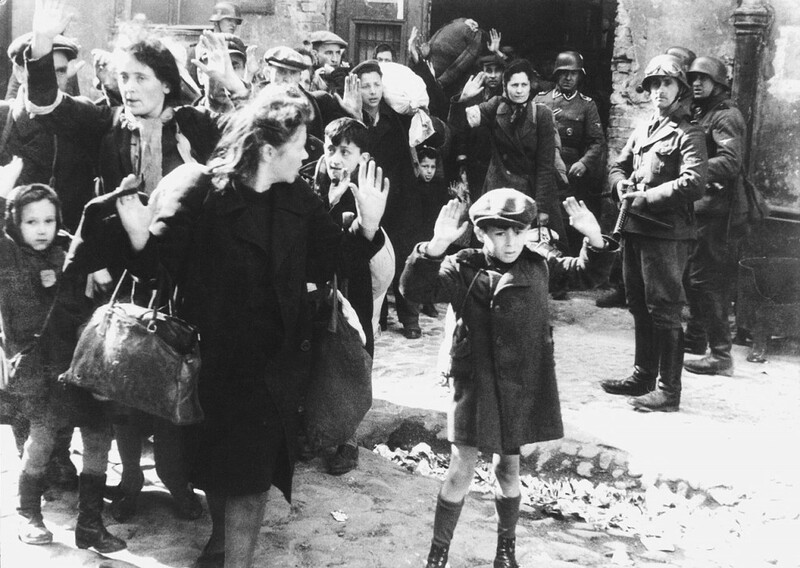 But by April 1943, the Jews remaining in the ghetto had finally realized that the deportations were to extermination camps, and they decided to resist. Armed with Molotov cocktails and a few handguns plus some weapons captured from the Germans, the Jews of the Warsaw ghetto put up a fierce resistance. The Germans sent in crack troops, equipped with artillery and armour. Resistance continued well into May, although the end was inevitable. Over 10,000 Jews died in the fighting. The remaining inhabitants of the ghetto, some 50,000, were captured and deported to extermination camps such as Treblinka. The photograph above is one of the most famous pictures of World War II. It was taken by the Germans and originally used for propaganda purposes. Notice that the soldiers have eagles on their left sleeves, clear indication that the troops are SS. This entry was posted in World War II and tagged Jews, Warsaw, Warsaw ghetto. Bookmark the permalink.